A few weeks ago the office was having a clearout, and they kindly let me drop by and plunder their overstock of old reports. 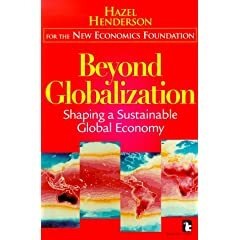 I came away with as many reports (actually slightly more) than I could comfortably carry back to Luton, and among them was Hazel Henderson’s little book ‘Beyond Globalization – Shaping a Sustainable Global Economy’. It was published ten years ago, and it makes sad reading, because it shows how little we have learned in the intervening decade. ‘Beyond Globalization’ is a critique of a “bubble economy” spun out of derivatives and financial trickery rather than people and goods. As we all know, that bubble popped in 2008. It seems obvious now, with hindsight, that 1999 was something of an opportunity. The Asian markets had collapsed, and the consequences of the new globalised economy were very clear. The internet had accelerated money flows in unprecedented ways, and the failure of the Long-Term Capital Management hedge fund in 1998 had shown how easily a large financial institution could spiral into crisis. It was obvious in 1999 that the systems of international trade that were drawn up in the 1940s were no longer working. The G7 discussed it and agreed to begin a process of change. There was widespread agreement that the IMF needed to be reformed, and that financial markets should be better regulated. International codes of conduct for accounting were proposed. Why didn’t these things happen then? Why did it take ten years before these things were discussed again? I suspect a large part of the answer is the Bush administration, which began its eight-year reign of unhelpfulness soon afterwards, but that’s no excuse. The world wasted a major opportunity around the turn of the Millennium, and we’re paying for it now. Since we didn’t take those difficult decisions by choice then, we’re making them of necessity now. It’s interesting to see how many of Henderson’s recommendations are now being implemented, from control of tax havens to IMF special drawing rights. Some of the more radical suggestions, such as the ‘citizen’s income’ or the ‘Tobin’ tax haven’t gained any traction yet (although I believe it’s only a matter of time on both of those), and her calls for the global economy to be subordinate to social policy have fallen on deaf ears. Among the more radical proposals are an expanded role for the UN. “We can safely reduce the world’s military budgets” she writes, “by employing insurance instead of weapons.” Countries would pay into a global security agency that would be a partnership between peace-building NGOs, the UN and private insurance companies. This agency would mediate, but would also have a guaranteed rapid-deployment force if and when necessary. Henderson takes a holistic view of the economy, informed by systems thinking, and recognises the need for re-shaping at all levels. This incorporates seven different arenas – global systems, international systems, nation states, corporations, provincial systems, civic society, and family and individual behaviour. Sustainability needs to work at every level, and this seven-level economy is a model I may well use elsewhere. Finally, there is an optimistic perspective to the book that I’ve not heard before that I will also take away – that globalization has created a generation of people who are aware that they have responsibilities to future generations, and to people in other parts of the world. We may not always act on those responsibilities, but they are there none the less. As we inevitably transition away from a globalized world towards more local future we will, as a species, have learned some invaluable lessons. Incidentally, I’m aware that I spell globalization and globalisation interchangeably. I presume the z is an Americanisation. Anyone know which one I should stick to? The Oxford English Dictionary says that both -ise/-ize endings are both valid in most cases. Style guides will recommend you pick one and stick with it: I prefer -ise, but really, it doesn’t matter. Hmm, that’s what I thought. I shall have to make a decision. That’s interesting, Tebogo says Henderson’s approach is basically about approaching ‘all the systematic root causes, from top to bottom level…… and Jeremy says ‘we will, as a species, have learned some invaluable lessons’. I find that the ‘root causes’ are within ourselves, in the less helpful part of our human nature, so it will be interesting to see how that could be approached by a book or any other method. And for Jeremy -‘necessity is the mother of invention’ so we will learn how to be more independent, like we used to be, but will that teach us what went wrong before or will it just repeat itself as soon as the necessity is removed? Just putting it forward for consideration, nothing else. Next Entry Is your bank financing the arms industry?